The Wizard of Oz, alphabetized. 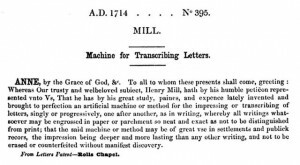 As we strive for order in all things, we might recall that it was on this date in 1714 that English inventor Henry Mill was granted a patent (UK #395) for an apparatus “for impressing or transcribing of letters singly or progressively one after another, so neat and exact as not to be distinguished from print, very useful in settlements and public records”– generally agreed to be the first description of a typewriter, the device that revolutionized the ability of creative minds worldwide to put their thoughts into print. Mill never actually manufactured a typewriter for sale; in fact, it took many years to develop a truly functional prototype– the first of which was probably built by the Italian Pellegrino Turri in 1808 for his blind friend Countess Carolina Fantoni da Fivizzono. Indeed, most early typewriters were aimed at giving the blind a means of communicating in print. It wasn’t until the late 19th century (and the introduction of a QWERTY keyboard design as a standard) that typewriting became a wide-spread practice.